Kugel is a traditional Jewish dish eaten at holidays. Growing up, I had the opportunity to eat kugel with my friends celebrating Jewish holidays. I’ve been told that there’s endless variations of kugel, but one of the most common versions has raisins. I have an aversion to raisins (in that I do not like them), so I made mine with apples. If you have not had kugel before, I highly recommend giving it a try! With Yom Kippur coming up, this week is a perfect occasion to try it for breaking the fast once Yom Kippur is over (and if you aren’t observing, you can make it whenever you choose). You can eat it for breakfast or as a side dish for dinner. It is slightly sweet, noodle tastiness. Cook the egg noodles according to the package directions. It is important that you use egg noodles and not normal pasta noodles. I’m not going to pretend this is really healthy, but it show tastes good! And bonus points because you’re adding fruit. Mix the eggs, sour cream, cottage cheese, spices, agave, honey, and melted butter in a large mixing bowl. If the sight of cottage cheese makes you want to gag, you can probably substitute cream cheese. However, I recommend giving it a try with the cottage cheese. Once everything is mixed evenly, you will not even taste it. Using an immersion blender, blend until smooth. If you don’t have an immersion blender, you could put everything in a food processor or a regular blender. If you don’t have either, you can get everything as smooth as possible with a whisk or spoon. However, I highly recommend buying an immersion blender. They are not too expensive and are great for lots of things, especially making soup. 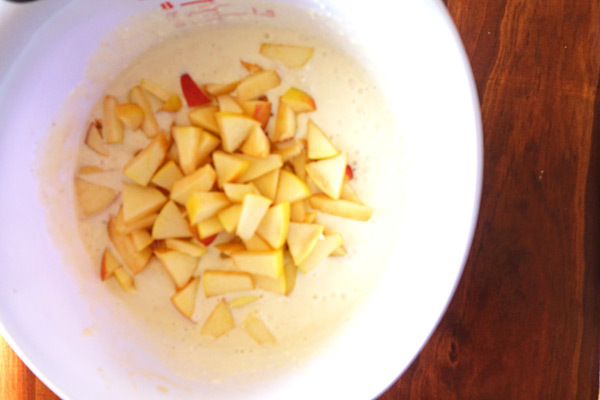 Add the apples into the batter and stir until combined. Mix the noodles into the large bowl. Honeycrisp apples are my favorite (representing for MN! 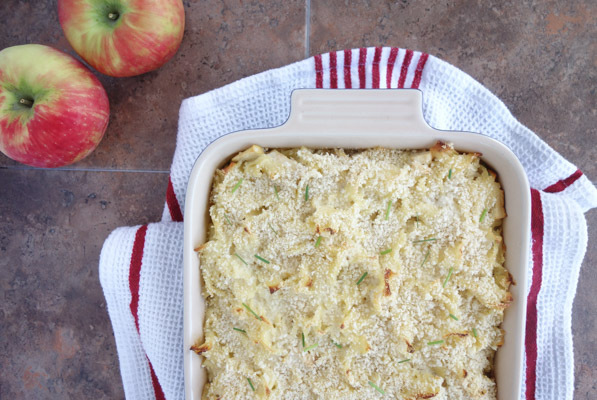 ), but Gala apples are also good in this kugel. Butter a casserole dish and pour the noodles into the dish. Top with the breadcrumbs. Bake in a 350 degree preheated oven for 45 minutes or until the top begins to turn golden brown. You just made kugel, mazel tov! In large bowl, mix eggs, sour cream, cottage cheese, spices, agave, honey, and melted butter. Using an immersion blender, blend until smooth. Add apples and mix until combined. Pour cooked noodles into egg batter and mix until all noodles are coated in the egg batter. Butter 9 x 13 casserole dish with the softened butter. Pour noodles in casserole dish and spread evenly. Evenly spread bread crumbs over noodles. Bake for 45 minutes or until bread crumbs are golden brown. Kugel is one of those dishes that I love, but forget about too often. Thanks for this yummy reminder, and I love your version with apples!